Have fun on a tour with a young, lively college student excited to show you the Statue of Liberty and Ellis Island! 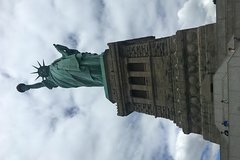 This tour includes the ferry to the Statue of Liberty and entrance inside the pedestal of the Statue of Liberty before traveling to Ellis Island where a highlight tour of the Immigration museum is also included. We will make sure no one on the tour is bored! • You will meet your student tour guide at the flagpole at Castle Clinton, inside of Battery Park. They'll probably have some sort of apparel to represent their school! • The tour will go through old military fort "Castle Clinton", then to the security tent that precedes the ferry. • Reserve track entry tickets are included. • We will depart the ferry at Liberty Island, discussing its history and then enter the actual Pedestal of the Statue. T The Pedestal houses the museum on Ellis Island and also offers great views of the harbor and skyline from its deck! • After taking plenty of great pictures from many different places on Liberty Island and from the inside of the Statue, we will board the ferry for Ellis Island. • At Ellis island we will go through the experience of the first immigrant to arrive in the 19th century "Annie Moore". We will go through the immigration museum and memorials before taking the ferry back to Manhattan, unless your group chooses to remain on Ellis Island to relax, eat, or even look up family records!